Land of Nod, the youthful branch of Crate and Barrel, is aimed at children and preteens; but after reviewing their stock last night, I found more than a few items that would blend easily into a sophisticated, adult setting. Plus, because Land of Nod is marketed as children's decor, the prices feel like a steal. 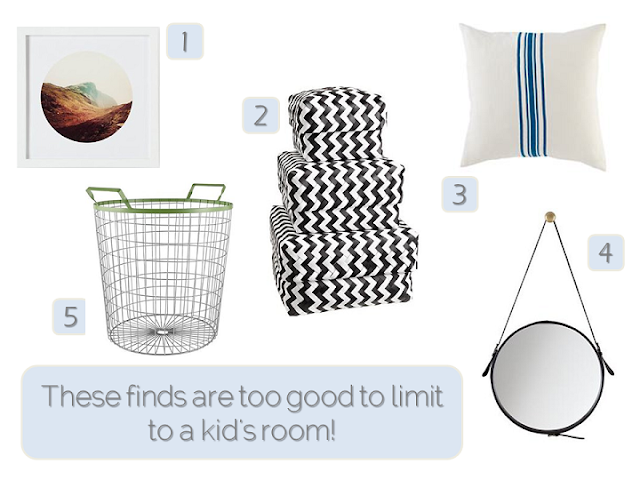 Are there any items from Land of Nod that you're eyeing for your sophisticated spaces? I may be ordering an item or two before the day is through. Well, well. I had written off Land of Nod in the past as being for kids only, but yowzers. This stuff is great! Love Land of Nod (and PB Kids, for that matter!). Great selection of fun, colorful rugs, too! Maybe I should stop tossing that catalog directly in the recycling bin when it arrives. Man, this is some great stuff! Great finds, Ashley! I think they're mixing it up a little bit over there. I've often shopped for my kids' rooms there (that's where both my daughter and son's beds came from), but I'm loving these more sophisticated pieces as well. You are a super shopper - I always love your finds! Happy Weekend! Wow! Thanks for sharing. Especially love the round hanging mirror. I've had my eye on that blanket for myself...glad I'm not the only one!